JNN 19 Mar 2014 Washington D.C : The United States on Tuesday ordered the Syrian embassy in Washington and its consulates in Texas and Michigan to suspend operations and told diplomats and staff who are not U.S. citizens or permanent residents to leave the country. “We have determined it is unacceptable for individuals appointed by that regime to conduct diplomatic or consular operations in the United States,” U.S. special envoy for Syria Daniel Rubinstein said in a statement, according to Reuters. It comes three years since the start of the bloody civil war in Syria that has killed more than 140,000 people. U.S. special envoy to Syria Daniel Rubenstein said the order responds to a decision by the government of Syrian President Bashar Assad to suspend its own consular services, according to AP. However, Rubenstein said the U.S. wants to continue diplomatic relations with Syria and maintain a relationship if Assad steps down from power. 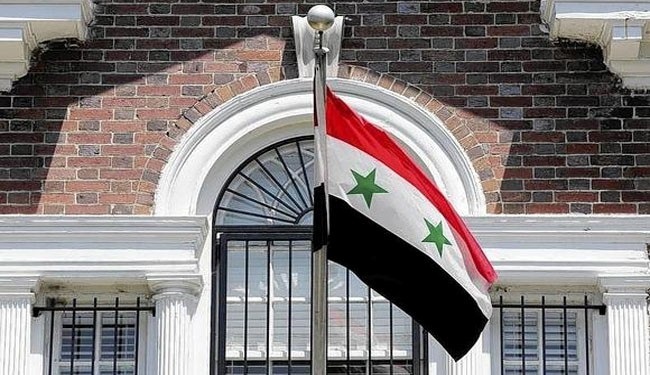 The Syrian embassy in the U.S. capital had been operating for some time without an ambassador and with only a few low level staff who had been providing limited consular services. Washington also said Syrian diplomats at the embassy who were not US citizens or permanent residents were no longer allowed to work in the United States and must leave the country. The statement did not address the issue of the Syrian mission to the United Nations based in New York. This entry was posted in America, Middle East, United States and tagged bloody civil war in Syria, consular services, Syria Daniel Rubenstein, Syria Daniel Rubinstein, Syrian Consulate, Syrian Embassy, Syrian embassy in Washington, syrian president bashar assad, United States. Bookmark the permalink. I thought diplomatic mission never existed for the last three years . It is good it is completely finished . what is the use of the mission of a failed state . US , UK intervention was the least desirable in this rebellian of Syrian apposition in collaboration with the zionist saudia which caused the killings of at least one lakh forty thousand peoples in three years .Hell with the zionist-Saudi US and UK nexus .